Gales & Girls is an interesting pin-up illustration book from Takashi Fujisawa (藤沢孝). The artworks feature girls dressed up in military mecha-like exo-suits. But they not really mechas though. Imagine a battleship that's split into parts and being worn as a costume. Now imagine that using fighter jets, tanks, submarines and even helicopters. This is how the girls appear in the book. It's almost like they are cosplaying as military vehicles and warships. The illustrations are fantastic and beautiful. The concept might be extreme but the finished designs look great. Takashi Fujisawa's linework and anime style colouring is amazing. 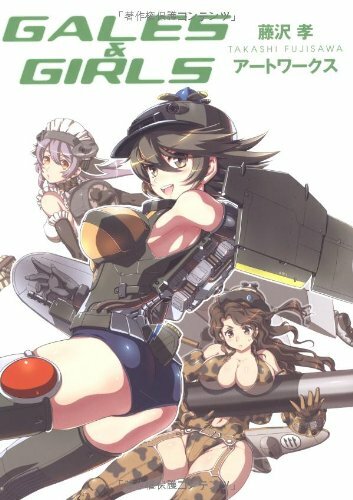 The latter pages features girls who flies all sorts of aircraft in their military uniforms. The designs for the aircrafts are in chibi style which means they are really cute, but they also look like sophisticated flying machines. There are also some school girl art. Overall, it's a wonderful artbook. Recommended to those who like pin-ups and mechanical stuff like mechas, robots.